At least 235 people have been killed after militants launched a bomb and gun attack on a mosque in Egypt’s North Sinai province, state media say. The attack is the deadliest of its kind since an Islamist insurgency in the peninsula was stepped up in 2013. Egypt’s President Abdul Fattah al-Sisi vowed to respond with “brute force” after talks with security officials. No group has yet claimed the attack, but militants affiliated with ISIS have been responsible for scores of deadly attacks in the province. 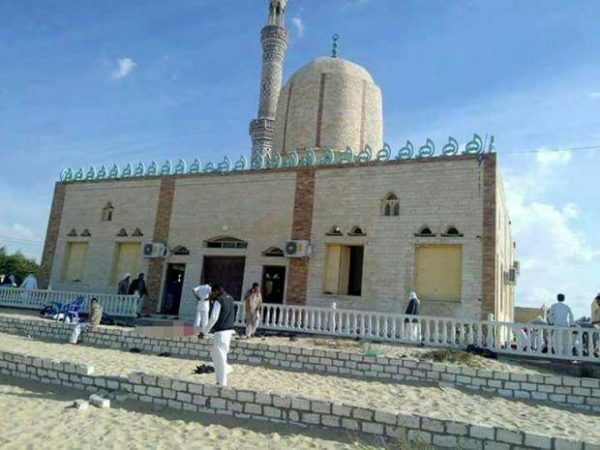 ISIS militants usually target security forces and Christian churches, and the bloody attack on a mosque associated with Sufi Muslims has shocked Egypt. According to witnesses, dozens of gunmen arrived in off-road vehicles and bombed the packed mosque before opening fire on worshippers as they tried to flee. Bir al-Abed is about 130 miles from Cairo. The head of ISIS’ religious police in Sinai said last December that Sufis who did not “repent” would be killed, after the group beheaded two elderly men reported to be Sufi clerics. Hundreds of police, soldiers and civilians have been killed since then, mostly in attacks carried out by Sinai Province group, which is affiliated to ISIS. Sinai Province is thought to want to take control of the Sinai Peninsula in order to turn it into an Islamist province run by ISIS.